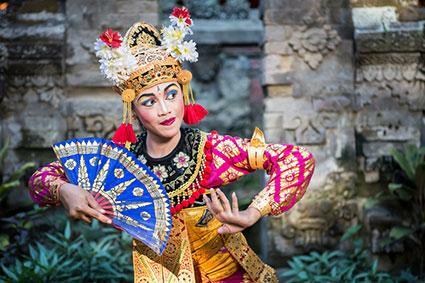 Ramayana dancer in a temple of Bali. Ceremonies, festivals, and other rituals provide a structure for an individual or a group to reaffirm social values and ties. They tend to be public events, seen as different from everyday, which spotlight an important personal or cultural happening. Ritual helps to give meaning to the world in part by linking the past to the present and the present to the future. Ritual works through the senses to structure our perception of reality and the world around us; it is often when a society's deepest values emerge in the form of activity, objects, and dress. Ceremonies often combine religious belief with social and political concerns. Although rituals tend to evolve very slowly, cultures do change over time, and possible disjunctures may develop between a ceremony and the attitudes of the society, resulting in the modification or even elimination of the ceremony. The costumes worn at these times are frequently special to the occasion and dramatically symbolic; they can reflect historical or cultural preferences that are no longer in vogue. Different stages or events characterize some celebrations, requiring many changes of costume or dress. Dress is an inclusive concept that involves modifying the body by the use of textiles, cosmetics, scars, coiffures, apparel, jewelry, and accessories held by or for a person. Although in general dress can range from temporary acts of covering and adorning to permanent acts of modification, such as scarification, ceremonial dress is usually of a temporary nature. Unlike masquerading, dress is not meant to transform an individual into something else but to enhance the identity of the individual. In many cultures, costumes have been used in a wide range of festivals stressing community solidarity or declaring the right of a person or group to a particular status, office, or possession. 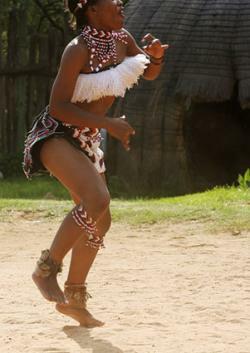 Since the nineteenth century, the Zulu of South Africa have used clothing and jewelry made from imported beads to demarcate changes in status associated with different life-cycle stages. Children and married women usually wear less beadwork. Young girls attire themselves in square or rectangular beaded loincloth panels attached to a bead string; pregnant women dress in leather aprons decorated with beadwork; and married women wear a knee-length skirt made of pleated goatskin or ox hide, hoop-like circular necklaces, and a flared headdress in the shape of a crown covered with red ocher or red beads and a beaded band around its base. The color schemes of beaded necklaces convey social messages about stages of physical and social development. Small rectangles, zigzag or vertical bands, diamonds, triangles, and lozenges are the most widespread motifs. A rite of passage is a common ceremony that involves a transition from one status or condition to another. For an individual, these include birth, puberty, marriage, and death. Scholars usually divide this type of ritual into three stages: separation, a transitional or liminal one, and rein-corporation; the latter two are most often associated with distinctive dress. For a community, annual rites of passage mark seasonal changes or cycles of renewal and regeneration. Individual and community rites of passage serve to enhance social solidarity, confirm membership in a group, and channel any anxiety resulting from the potential dangers of the transition. Societies throughout the world institutionalize the physical and social transformation that boys and girls undergo at the time of puberty by marking their passage from childhood to adulthood. There is, however, considerable variation in the timing of the ritual, length of ritual, and age of initiate. As part of the puberty ceremony carried out among Sepik River peoples in New Guinea, newly initiated boys enter a men's meetinghouse, the political and religious center of the community; after passing across the threshold, the boys encounter sacred cult objects that play a role in their introduction to appropriate beliefs and behavior. The young men are also given body paint in the course of initiation. After residing in the cult house for months, the boys return to their village as adults when all male members of the house elaborately decorate their bodies as a statement of their own attractiveness, to display characteristics identified with being a successful male and to identify themselves as sacred beings from the world of the ancestors. The men-dressed in fiber skirts-paint their bodies with yellow, black, red, and white curvilinear patterns. Paint is believed to be sacred and clearly adds to the seriousness of the occasion. Red and white are especially favored because these colors are associated with brightness and are viewed as auspicious. A wicker headdress adorned with flowers and feathers as well as large shells worn on the chest and forehead enhance the brilliance of the costume. In addition, other accessories of shell, bone, boar-tusk, seeds, and feathers are worn. Feathers are noteworthy for symbolizing growth and power. In the early 2000s, the most important Apache ceremony is the girl's four-day puberty rite-sometimes referred to as the Sunrise Dance-that was taught to the Apache by White Painted Woman, an important deity in the American Southwest. A similar ritual is held by the Navajo, but the Apache put greater stress on the benefit of the ritual to the community. The ceremony is organized by a shaman hired by the girl's family who also select godparents to assist the young girl during the ceremony and throughout her life. On the second night, male masqueraders called Gan, wearing plank headdresses made of slats of agave stalk, impersonate Mountain Spirits who bless the area and help protect the community from dangers and disease. During the Apache puberty ceremony, the young girl is dressed in either a buckskin skirt or a long cotton skirt and a buckskin smock or cape painted yellow, the color of sacred pollen said to symbolize fertility. These garments are decorated with symbols of the moon, sun, and stars. Both skirt and smock utilize fringes that could represent sunbeams. An abalone shell is worn on the fore-head along with shell necklaces, shell earrings, and feathers for the hair. Metal bells, buttons, and decorative metal cones cut from cans dangling from the dress have been used since the early nineteenth century. Buckskin moccasins and leggings might be added to the ensemble. The various items of dress must be put on in a prescribed sequence and draped in a particular way. The outfit of the girl, based on traditional female dress, is now specific to this ceremony; in the past, the Apache wore various items of dress made only from animal skins. The use of an older material or clothing style for ceremonies is not uncommon. At the time of puberty in the West African country of Sierra Leone, Mende girls begin an initiation process into the female Sande association where they learn traditional songs and dances and are educated about their future roles as wives and mothers. During seclusion, the girls are covered with a white pigment of crushed shell and chalk and wear ornaments that define their status as novice and indicate that they are under the protection of the association. Formerly, this period lasted for several months, but in recent decades, the period has been reduced to a few weeks. After successfully completing all initiation obligations, the girls with similar hairstyles and dressed in fine clothing form a procession and parade back to town accompanied by masked dancers. Sande is the only documented African association in which women both own and perform masquerades. The masks- characterized by a shiny black surface, fleshy neck rolls, delicately carved features, a smooth, high forehead, and an elaborate coiffure-are seen as expressing a Mende feminine ideal. The coiffures of the mask are actually based on popular types of Mende hairstyles, especially those worn on special occasions by women of high status. The arrangement of the hair into a series of longitudinal ridges is a common coiffure and has been documented on women at the turn of the fifteenth century; it indicates the role of women as cultivators and bearers of culture. Elaborately painted body decoration and scarification are customarily associated with initiation ceremonies in many parts of the world. Among the We of the Ivory Coast, the faces of young female initiates are painted when they leave the excision camp by initiated women, skilled in body painting. They paint the faces of the young girls with schematic designs in black, blue, red, and white. The girls' torsos are sprinkled with oil and rubbed with snail shell or porcelain to make their bodies shine; they will also wear a woven wrapper, necklaces, and bracelets. The purpose of such embellishment is to make the girls look attractive. After emerging from the camp, the initiated girls sit in state, displaying their newly acquired social status as marriageable women. Changes in role and status have been correlated with irreversible forms of body art to emphasize the accumulative and unalterable nature of the transition. Among the Ga'anda of Nigeria, girls are given facial and body scarification to mark different stages of their transition into adulthood. This procedure begins when a girl is five or six and at each stage consists of rows of slightly raised dots that form linear and geometric patterns. The scarification is displayed at each stage and when completed expresses the permanent nature of the transition as well as a visual identification with the group. At these times, the girls wear only a simple woven cloth apron allowing for maximum visibility of the body designs. For centuries, the Kalabari people of southeastern Nigeria have worn an assortment of both foreign and indigenous items of dress. These they assemble into a distinctive ensemble that for women consists of an imported lace or eyelet blouse and a combination of wrappers embellished with bead, gold, or coral jewelry. The Kalabari do not produce textiles themselves, but purchase hand-woven textiles made in Nigeria and Ghana along with imported, factory-made textiles. This type of composite dress is especially apparent during iria, a series of ceremonies that mark several stages of a woman's life. When women reach both physical and social maturity, they are allowed to tie and layer a series of short cloth wrappers around their waist to increase the bulk of their midsection, symbolizing their role as society's procreators. Textiles signify a family's wealth and are stored in special cloth boxes that are passed down from one generation to the next. The Kalabari also make use of these textiles by decorating funerary chambers of socially prominent elders with rich displays of heirloom textiles. The degree of a chamber's elaboration is directly related to the deceased's success in life. A group of elderly women, skilled in selecting and arranging textiles, completely drape the ceiling and walls with cloth. The bed, where the corpse is laid in state, is the visual focus of the chamber. Personal accessories that belonged to the deceased, such as beads, fans, canes, and textiles are folded and layered on the bed to reveal a variety of patterns, textures, and colors. The display of the family's textile collection in the funerary chambers is believed to facilitate an elder's transition from the human community to the realm of the ancestors. Many societies or cultures associate a particular color or type of costume with mourning appropriate for wearing at funerary or memorial ceremonies. The Frafra of northern Ghana have elaborate funerary rituals that emphasize dress. The ordinary male funerary costume consists of a smock, quiver, bow, flute, and headdress. This costume, which is based on the dress worn by both hunters and warriors, symbolizes the origins of Frafra society and its early history. The most common funerary headdress, worn by any male old enough to be a hunter or warrior, is a wicker cap with a hole in the top for inserting a stick or bundle of reeds covered with the hair from the neck of a sheep. The use of sheep hair reflects the importance of domesticated animals, especially for sacrifices. Such a helmet may be made by the owner or purchased in the market. On the other hand, the wicker helmet with horns can be worn only by a hunter. The female funerary costume is based on traditional female dress. In much of northeastern Ghana, women in the past wore woven grass waistbands with small forked leafy branches attached to the front and rear. This leaf form has been replaced almost entirely by a tail made of dyed grass or leather strands. Women would receive such elaborate "tails" during courtship as signs of admiration and intent. The grass or leather "tails" are viewed as proper dress for special occasions. Today, a commercially printed cloth for the upper torso or head tie is often added. In addition, a woman may wear stone or ivory armlets to reflect pride in her family and household. A wedding ritual not only unites two individuals, but provides a permanent linkage between families and kin groups. Ceremonies marking marriage put considerable emphasis on elaborate and often colorful dress. In Central Asia, special garments tailored from silk cloth were worn at marriage by high-status, wealthy women during the nineteenth century. Because Central Asians viewed silk attire as accumulated wealth, dresses and robes were seen as important components of a woman's dowry. For the marriage ceremony, women attired themselves in a series of dresses, worn in a layered manner so that the richly patterned sleeves of each dress were visibly displayed; an outer robe completed the bride's dress ensemble. This collarless robe, which was close-fitting in the torso with a flaring outward toward the hem, was worn open in the front to reveal the bride's brightly colored dresses; outer robes, considered the most sumptuous of all of the bride's garments, were held in such high esteem, that one or two of them were even draped over the owner's body during her funeral ceremony. The garments were fashioned from hand-loomed silk cloth, decorated with designs made using the ikat-dying technique in which the thread is tie-dyed prior to being woven. The designs were usually created through a process of tie-dying the lengthwise or warp threads before plain colored crosswise or weft threads were woven into them. In the finished textile, the edges where the warp threads had been bound together for dyeing, show a blurred, irregular outline. The traditional dress for a Tunisian woman consists of a silk, cotton, or wool wrapper draped around the body and attached on the chest with one or two fibulae and gathered at the waist with a sash. The wrapper is covered by a loose-fitting tunic with seams on either side and, for some, sleeves made from another more exquisite material. This type of outfit is now used only for weddings with each region having its own specific patterns and colors. Women are allowed to express their own individual taste and preference. Tunisian wedding tunics are decorated with elaborate embroidery, sequins, and gold-covered wire thread. There is an increasing emphasis on such gold work, especially in the urban areas. Embroidered designs may represent popular symbols of luck such as a star, birds, fish, and crescents. Similar tunics are found in other parts of North Africa. The wedding costumes and jewelry, which have become increasingly expensive, may be borrowed from neighboring families or rented from a female specialist who helps plan wedding ceremonies. For jewelry, silver is preferred because it is believed to be pure and propitious. Women wear a variety of tunics with different types of decoration and design at distinct ceremonies during the wedding ritual. In Tunisia an important part of the wedding ceremony is for a bride to be displayed formally to the groom, her relatives, and the relatives of the groom. At these times she is dressed in several different tunics that she removes one by one until she is in the last one, the richest of all. 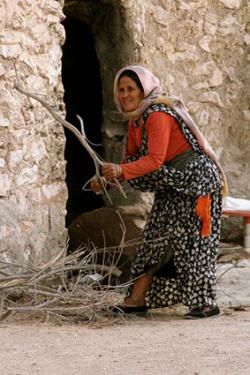 For North Africans, marriages represent a significant change of status and require considerable expense and attention; they last for several days and most people of the village will turn out for the event. Costumes may also express cultural identity or member-ship in a group. For the Yoruba of Nigeria there are a number of secular occasions where dress plays a prominent role in affirming a person's Yoruba identity. Both family and community ceremonies, including funerals, childbirth, and child-naming occasions, weddings, chief-taincy celebrations, and house-opening feasts are important social events where members of different extended families come together and dress in their finest clothing. Men wear a gown ensemble consisting of tailored gowns, trousers, and hats made from strip-woven cloth while women wear a wrapper ensemble, blouse, and a head tie. The Yoruba have a custom called aso-ebi, where male and female members of families and social clubs appear together in dress made of the same type of cloth. Aso-ebi cloth may be special-ordered or purchased at the market and when worn, it visually reinforces the group's cohesion. In the northwest coast of America, the confirmation of an inherited privilege or the authentication of a new rank or status occurs during a special type of public ceremony called a potlatch, which is especially well developed among the Kwakiutl, Haida, and Tlingit. A potlatch is often held over a period of days and accompanied by the display of objects and the giving of gifts to the guests. The acceptance of these gifts and the acknowledgment of their purpose are critical components of a potlatch. Although the ordinary dress of the northwest coast in the eighteenth century consisted of fairly plain cedar bark capes and blankets, when attending potlatch events, people dressed in their best clothing and seated themselves according to rank. Ceremonial garments in this area are colorful, elaborately decorated, and spectacular. A wealthy man might wear a Chilkat or button blanket, a waist robe or apron, a shirt, leggings, and a headdress, often made of woven spruce root or cedar bark. To the headdress, a carved frontlet, ermine strips, or basketry rings could be added. Trousers are currently worn under the garments. The costume of wealthy women is similar to that of men except for the substitution of a plain dress for the trousers or robe. Shredded cedar bark and mountain goat wool are used for weaving the Chilkat blanket, considered as a family heirloom. This garment is rectangular at the top and the sides and from the bottom edge in the shape of a shallow V, there extends a long warp fringe about one-quarter the length of the blanket. The surface design is clearly a transfer from another medium (painting) and has the effect of a low relief. In addition, the curvilinear forms, characteristic of northwest coast art, is successfully achieved. Black, blue, white, and yellow are the colors that establish the patterns. A newer ceremonial covering is the button blanket consisting of a dark blue blanket-usually Hudson's Bay blanket-decorated with red flannel border and appliqué outlined in small iridescent pearl buttons. Buttons are used as well for creating the details of an image. Dentalium shells-a symbol of wealth-could also ornament a button blanket. The images are normally crest animals, such as a raven, whale, beaver, or eagle, which connect to clan myths. Ceremonial dress associated with identity and renewal can also reflect social and political points of view or be used for other functions such as protection. Although metal armor was worn by warriors and rulers in Europe as far back as ancient times, in the fourteenth century, overlapping plates of steel were developed to produce a more effective way for covering the entire body. Since plate armor was quite expensive to make, it was limited to warriors of noble birth and became an indicator of status. During the following two centuries, knights and kings who rode into battle on horseback both protected and defined themselves with full suits of plate combat armor while providing a festive element to the occasion. For tournaments or jousting events, knights needed to wear armor made of even heavier metal and often more elaborately decorated. Armor served to protect an individual as well as to enhance appearance. Therefore, decoration, based on a variety of metalworking techniques such as embossing, engraving, and etching, expressed the wealth and status of the wearer. The most commonly used technique in decorating armor was etching. The Great Plains of North America consisted of many tribes sharing a dependence on the buffalo as a source of food and raw materials. The standard ceremonial regalia for a Plains' warrior included a painted buffalo robe, quill shirt, leggings, moccasins, and some kind of feathered headdress. Plains ritual, which encompassed songs and special dress including body and face painting, were performed for a war campaign, a major buffalo hunt, and a community ceremony such as the sun dance, which focused on renewal. All clothing was made by women who were responsible for tanning animal skins and tailoring the various garments. For the American Plains, the buffalo robe was a distinctive type of dress, which could be painted by men with figurative designs illustrating historical events-especially military exploits-hunting scenes or, in some cases, supernatural visions. Plains cultures attached great importance to these visions and animals were frequently involved, especially buffalo, elk, bears, eagles, and sparrow hawks. The designs, which can symbolize less visually obvious ideas, were usually arranged horizontally without any overall composition. The actual painting of a buffalo robe was the responsibility of the owner. Originally the colors, each applied with a separate brush, were made from mineral or vegetable material. Quillwork and beadwork embroidery were also employed to adorn a robe. For the people of the Plains, robes served as an expression of both individual and community exploits. A men's robe is similar in form and construction to a woman's dress except it is shorter and has full sleeves. The symbolic power of traditional Plains clothing was acknowledged again in the late nineteenth century with the Ghost Dance movement, a revitalization movement based on a belief that the Great Spirit would clear away the wreckage of the white man, bring back the buffalo herds, and reunite the Native American people-both living and dead-in a regenerated Earth. The ceremony, which originated among the Paiutes but quickly spread north and east to other Plains groups, began either late in the afternoon or after sundown and involved a circular dance, from East to West, following the movement of the sun. Preliminary activities included painting and dressing the body that took about two hours. The painted designs were an inspiration from a trance vision and consisted of elaborate designs in red, yellow, green, or blue upon the face or a yellow line along the parting of the hair. Suns, crescents, stars, crosses, and birds (especially crows) were the designs usually associated with both painting and clothing. Stars were the most common motif and consisted of a variety of forms such as the traditional four-pointed star, the five-pointed star of the American flag, dashes of paint representing falling stars or the many stars in the heaven. It was by wearing Ghost Dance shirts and dresses that the Great Spirit would recognize his people. Both shirts and dresses were usually made of muslin or cotton but garments of elk, deer, or antelope skins were also produced. These garments were decorated with painted designs, cones, bone, quillwork, and feathers. An eagle feather was also worn on the head. Social status in most societies is usually expressed through the display of ornaments on the body; yet for a number of cultures, the permanent modification of the skin can exhibit societal membership or high status through scar and tattoo designs. For the Maori of New Zealand, tattooing was characterized by a dense, overall, and interrelated series of motifs organized into spiral and curvilinear patterns. In general, a tattoo results from pricking or piercing the skin and then pigmenting the punctured spots with a coloring substance. Pigment made from soot mixed with spring water, light fish oil, or plant sap, was rubbed into the cut skin. The entire process usually took months or even years to complete. Facial tattooing identified a man as belonging to a particular group and indicated the magnitude of his mana or spiritual power. Although permanent, tattooing was seen as a necessary item of dress for ceremonial occasions: each design had a specific name, and every tattooed individual was marked differently. People of high status had the right to be tattooed while those of lesser status had to earn that right. Wealth, position in the community, and the level of a person's courage would determine the extent and nature of the tattoos. The facial tattooing of a chief were considered so distinctive and varied that the chief would draw them at the bottom of European documents as his signature. Frequently, leaders of the community will dress in a distinctive fashion, especially during ceremonial occasions. An individual's political power, social position, and wealth can be made visible by dress expressing prominent status or indicating particular social roles such as warrior, judge, and police officer. We must not forget that ordinary people also wear special dress for important events, including weddings, funerals, high school proms, or even gallery openings. Usually it is the entire ensemble of clothing and accessories that project authority and status. But at times, a single item of dress may announce social position and political power. For example, among the Yoruba of Nigeria, a conical, beaded crown with fringe veil is the primary symbol of kingship and must be worn by the ruler on all ceremonial occasions. The veil obscures the face of the living king while a face motif on the crown reveals the dynastic ancestors. In this way, the crown represents the spiritual and political force of the dynasty. Crowns also reference royal power in European cultures. Royal dress and regalia has characterized the Asante people of Ghana since the seventeenth century. The two most spectacular elements of Asante dress are kente cloth and elaborate gold jewelry. Kente is a brightly colored, hand-loomed, narrow band cloth woven by men on a four-heddle horizontal loom. The weavers use silk or rayon thread to create bright color in a predominantly cotton textile. The names and meanings of kente designs can allude to proverbs, historical events, or important characteristics of leadership. During their reigns, Asante kings were expected to invent new kente designs. Kente is a good example of how a dress form that is adopted by another culture can shift meaning. In the United States, kente has become identified with African American culture and has been used in multiple forms and ceremonial contexts. The Asante have used gold extensively to adorn and glorify rulers as well as to validate their positions. The Asante king and various categories of chiefs wear many items of gold, such as necklaces, anklets, large armlets, and rings. Magnificently attired rulers, encumbered with as many gold ornaments as they can wear or carry while participating in religious or state ceremonies can be identified with the proverb "Great men move slowly." Gold objects are produced by the lost wax process or repoussé technique. In Polynesia the spiritual power of rulers and other high-ranking people was often expressed by wearing apparel made of feathers, which associated it with the gods. In Hawaii, one of the most centralized and status-conscious societies in Polynesia, feather cloaks, sashes, and helmets were important components of ceremonial dress, enhancing the authority and divine status of a ruler. Cloaks, worn on state occasions and during battle, provided spiritual, and to some extent physical, protection to the wearer. Capturing an enemy's feathered cloak was a particularly powerful symbol of defeat. The size of a cloak was directly related to the amount of power a noble person possessed. Because so many feathers were required to produce a cloak, only individuals of great wealth could afford them. Feathers were in part collected as tribute paid by commoners to the chiefs each year. Although ordinary clothing was made by women, the cloaks were made by high-ranking men. Passing a cloak to a descendant involved a transfer of mana (power) from one generation to the next. Feathered cloaks were worn wrapped around the body so that the edges come together unifying the motifs that flank each edge. Many cloaks were decorated with four yellow, bladelike motifs set against a red background. With the imposition of American rule in the late nineteenth century, feathered cloaks were no longer used for warfare but continued to be indicative of chiefly rank. Also, red feathers, associated with the god of war, were used less and yellow became more common as yellow feathers were rarer and more valuable. A complete clothing ensemble, consisting of cloak, robe, and turban, expresses religious identity as well as high social status for the Muslim Hausa-Fulani rulers of northern Nigeria and is worn for religious celebrations and major political events. On such occasions, the lavishly dressed ruler and officials of high rank appear in a public procession, mounted on richly adorned horses, to symbolically establish superiority over those they rule. Their dress not only sets the ruling aristocracy apart from the rest of the population, but also identifies the wearer with the larger Muslim world both within Africa and beyond. Robes, the most distinct part of the dress ensemble, are often worn layered, creating an imposing image of physical bulk and majesty. The visual focus of the robe, tailored from hand-woven or factory-made cloth, is a large pocket densely embroidered with geometric designs that are loosely inspired by Islamic calligraphy and believed to offer spiritual protection to the wearer. A turban is wrapped numerous times around the wearer's head and chin, creating an aesthetic effect that visually complements the bulky robe. The turban signifies that the man has completed the most important obligation of Islam-a pilgrimage to the sacred city of Mecca. Items in a ruler's dress ensemble are valued heir-looms that belong to the state; like the feathered cloaks of Hawaiian leaders, they can be passed on to descendants in the royal line or given as gifts to other rulers and officials to seal political alliances. Symbolic dress is not limited to other times and cultures. The dress of modern political leaders and their families shapes the public image as well. A case in point is the wardrobe of Jacqueline Kennedy during the campaign and presidency of her husband, John F. Kennedy. Kennedy was criticized for her extravagant wardrobe and use of foreign designers-especially when compared to the plain style of the Republican candidate's wife, Pat Nixon. Soon after the election, Kennedy worked with the American designer Oleg Cassini to re-create her image. As First Lady, Kennedy established a unique style that was dignified and elegant but also photogenic and recognizable. For her husband's swearing-in ceremony in January 1961, Jacqueline Kennedy wore a Cassinidesigned beige wool crepe dress. She also wore a pillbox hat from Bergdorf Goodman's millinery salon, in what was to become her trademark style-on the back of her head rather than straight and high, as was the fashion. Jacqueline Kennedy's style became widely popular and helped define the image of the Kennedy presidency as innovative, dynamic, and glamorous. Viewed globally, ceremonial dress involves many acts of body modification that reflect both indigenous development and outside influences. As cultural artifacts, the specific elements of apparel and body adornment have many aspects of meaning; they serve as vehicles for the expression of values, symbols of identity and social status, and statements of aesthetic preference. Each item of a costume has its own history and sociocultural significance and must be considered along with the total ensemble. By looking at ceremonial costumes in other cultures, it becomes possible to understand better the form and function of similar types of dress in one's own culture. See also Carnival Dress; Kente; Masks; Masquerade and Masked Balls. Adams, Monni. "Women's Art as a Gender Strategy among the Wé of Canton Boo." African Arts 26, no. 4 (1993): 32-43. D'Alleva, Anne. Art of the Pacific. London: Calmann and King Ltd., 1998. Eicher, Joanne B., and Tonye V. Erekosima. "Final Farewells: The Fine Art of Kalabari Funerals." In Ways of the River: Arts and Environment of the Niger Delta. Edited by Martha G. Anderson and Philip M. Peek, 307-329. Los Angeles: UCLA Fowler Museum of Cultural History, 2002. Mack, John, ed. African Arts and Cultures. London: British Museum Press, 2000. Perani, Judith, and Fred T. Smith. The Visual Arts of Africa: Gender Power and Life Cycle Rituals. Upper Saddle River, N.J.: Prentice Hall, 1998. Rose, Roger G., and Adrienne L. Kaeppler. Hawai'i: The Royal Islands. Honolulu, Hawaii: Bishop Museum Press, 1980. Ross, Doran. Wrapped in Pride: Ghanaian Kente and African American Identity. Los Angeles: UCLA Fowler Museum of Cultural History, 1998. Rubin, Arnold, ed. Marks of Civilization. Los Angeles: UCLA Fowler Museum of Cultural History, 1988. Spring, Christopher, and Julie Hudson. North African Textiles. London: British Museum Press, 1995.